The nonverbal communications embedded in French culture are a never-ending source of fascination for me here in Paris. Because I’m not fluent enough in French to catch certain subtle, revealing turns of phrase, I miss that part of the ‘delivery’ that might carry double entendres or hidden gems of humor in conversation. I do, however, catch a few of the visual clues that Parisians nonchalantly drop to establish their individualism, to communicate status, or otherwise to set themselves apart from the hoi polloi. Let me set the scene for one example: at a neighborhood cafe, the regular clientele covers the full spectrum, coming and going at fluid yet routine waves and intervals. Earliest in the morning, standing at the bar, the lime-green clad sanitation workers taking a break from picking up the trash or cleaning the streets. Coming a few minutes later, and brushing shoulders with them, the suit-clad professionals grabbing a morning cup of ambition (Dolly Parton’s phrase, not mine) prior to heading into the office. A little later, at the bar or at a table near a side door, the local boutique owners complain about the rain and its effects on their businesses, which they’ll open in a half hour or so. Then, a half hour later, tourists pack the tables and fuel themselves for a day of sightseeing, their excitement at being in Paris defying the weight of any jet lag. The footwear of each group is telling: the municipal workers in their clunky and mud-splattered black work boots. The male office workers in their black lace-up dress shoes. The boutique owners in functional dress and casual shoes, often with rubber soles for comfort. The tourists almost always in sneakers. Sprinkled among these various groups, often in a corner or wedged into a window seat at the end of the counter, is an aging member of the fading French nobility. He may or may not be a (formally, or formerly) titled aristocrat, but there is no doubt of his position in the community. His hair is white or silver. His expression is stoic: if he hasn’t seen it all, he’s seen a lot. His dress shirt is expensive, but not obviously so. His sweater is cashmere or wool, and has seen its better days, but he doesn’t give a damn. His sport coat is tweed, usually an earth-tone. He is layered and wrapped like a cashmere and wool turtle in the winter, with at least one scarf cocooning him against the cold. His baggy corduroy pants, often in eye-popping reds and lime greens, are the first class marker: he doesn’t dress for the office or for business. He doesn’t have a boss. He doesn’t have clients who need to approve or think well of him. 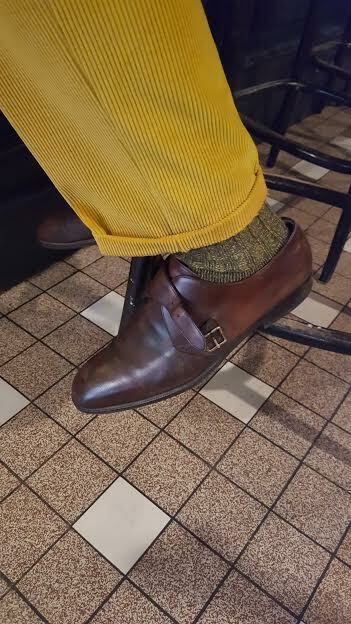 In a country where the majority of working men habitually opt for the slim cut black or navy business suit, white shirt, black or navy tie, and black shoes, these expensive, generous, and colorful cords are the French version of ‘go-to-hell’ pants. The unbuckled shoe sends a couple of important messages to the observant: first, ‘I didn’t walk very far to get here,’ and ‘I certainly didn’t walk very fast.’ And, one might add, ‘I won’t be in a hurry whenever I choose to leave.’ For me, the sound conjures an image of an outlaw entering a saloon in an old western movie, spurs chiming with each step, halting conversation and card-playing by the other patrons. There’s little notice here, in a modern day Parisian cafe. Tourists are generally oblivious to the local real estate prices (a 1500 square foot apartment recently sold for 2.3 million euros in our neighborhood). They don’t notice the steely, proud bearing of the blue-blooded denizens of our little village. Maybe because the traditional status symbols are absent, well-hidden, or simply fall on deaf ears with many Parisians. If you’re listening, however, the flapping, jingling monk straps softly speak volumes. Facinating, as always. Thanks for sharing! Actions have and will always speak louder than words around the globe however, didn’t know that attire had the same global voice. Since becoming apart of this blog I’ve learned something new daily and so much better off for it. While people-watching and waiting to collect family members at the international terminal at O’Hare, we used to play a game, “American or not”. 9 of 10 times, the shoes were the clue. I wonder if the wearer of the shoes here has them unbuckled because of the thicker winter sock, which is also charming, because he doesn’t actually wear a different shoe for the season, but makes a slight adjustment. That’s so very interesting! Heading there in two days for our annual stay. Must be in the lookout for these unbuckled shoes! Apparently, everyone virtue signals, even the old money crowd. Such a wonderful and evocative portrait! This reminds me so much of one of my professors in college many years ago. From a distance, as he walked around town, you would at first think he was a man who was down on his luck – loose, quite well-worn clothes, longish hair, a general air of having nowhere terribly important to go. It was only when you got closer that you noticed that his well-worn overcoat was cashmere as was his sweater, his pants (yes! cords!) worn but well-made, and his shoes old but polished. And when he spoke to you (always civilly, always asking, with genuine interest, “How are you? Are you happy today?”) that his grammar and diction were impeccable. It was only later that I learned that Dr. N. had been a member of the OSS during WWII, had served in various governmental agencies, and spoke eight languages fluently. So yes, those subtle signs are there for those who take the time to see and interpret them, and they always lead to fascinating people. I enjoy your vignettes of Parisian life very much and feel that I am sitting at a table with Ernest Hemingway, observing, enjoying and writing. If I may make a suggestion. Your writing is excellent, but your image selection is subpar at best (Thought I do like the image in this story). In fact, I believe it deters from your good writing. Blogs are as much about the visuals as they’re about the content. Perhaps spending a bit more time, sourcing interesting images to compliment your good writing! I’d venture a guess here and say this post’s image was taken at the cafe. And I got a chuckle out of the pun on “Message in a Bottle” reinforced by the picture and the narrative about the monk strap-dress shoe wearing aristocrat. So this post’s image game was pretty well done, as far as I am concerned. I like the images that Byron posts – I just wish I could blow them up larger on my screen. Sir—if I may: one should not write “the hoi polloi” but “the polloi” or “hoi polloi”. “Hoi” and “the” are definite articles. It would be the same as writing “the les gueux”. With best wishes. AEs and a pair of socks bought in bulk (wink)?